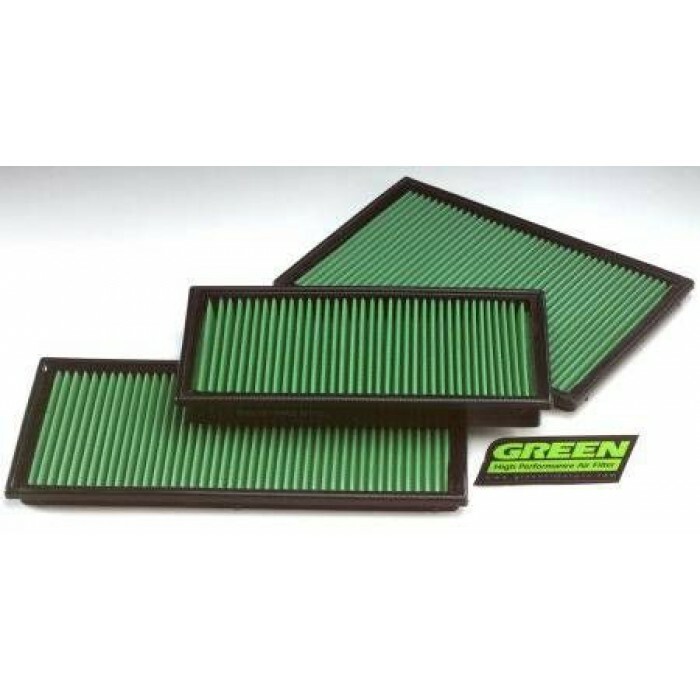 Green Cotton Panel Filters simply replace the existing standard air filter and offer reduced restriction of the air intake system thus optimising horsepower, throttle response and torque. Simple to fit, just remove the existing filter from the air box and drop in the Green Performance Filter. The filtration material used is a cotton gauze impregnated with a light oil and can be easily cleaned to save replacing your filter at service intervals. Unlike multi-layer gauze filters which can fray and release fiber particles into your engine, Green Filters uses two layers of tightly-interwoven cotton fabric. The 3 main benefits to woven cotten are the fact its thinner, holds oil better, and is stronger. Since its thinner, it allows better air flow without sacrificing filtration. The cotton holds the oil more evenly, and the medium is much stronger. Unlike gauze, you cannot wear a hole in woven cotton by rubbing it, and there is no way small bits of cotton can rip off since its interlocked with another piece.